In continuing the partnership between Rhodes University and Asiye eTafuleni, further anthropometric work is currently being conducted by a masters student in Warwick. AeT is encouraged that work is being done to understand some of the finer grained challenges faced by informal workers. Anthropometry refers to the proportions of the human body and this research falls under a greater focus area of human factors and ergonomics. This is the study of how humans interact with the objects around them and how to design environments to increase usability in terms of ease and efficiency. The research is aligned with AeT’s prior research with the Rockefeller Foundation into tools, and work around occupational health and safety; as well as ongoing work to develop a safer stove with the Mealie Cooks and MIT CREATE/ alternative development for urban economies. Left: Bovine Head cooks dish up cooked meat. Photo: Andrew Griffin. 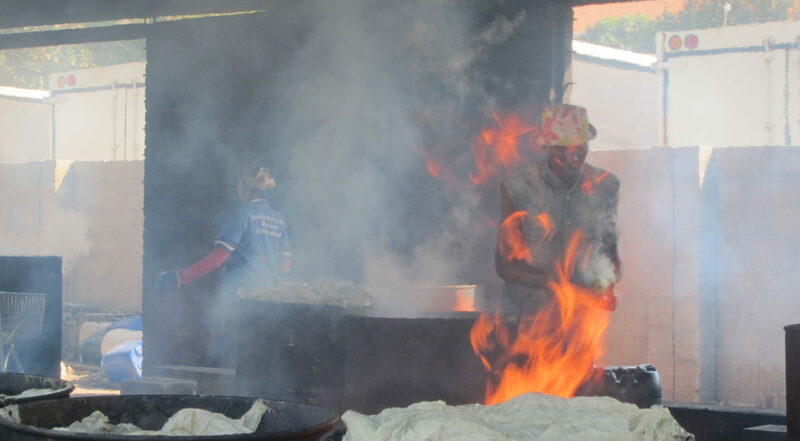 Right: Mealie cook at work. Photo: Rebecca Plumbley. The research is comprised of an activity analysis and interviews using open ended questions. This involves filming people at work performing different elements of their job or task; later this is analysed to understand how much time is spent working and what the physiological impact of the work is. The interview questions were developed using socio-technical design principles, which are the foundation of systems theory in macro-ergonomics. While micro-ergonomics would address a single element of a problem, such as a tool, macro-ergonomics looks at the systems at play and tries to understand if there are any factors interacting that would render any tool ineffective. The research is focused on the Mealie cooks and Bovine Head cooks as both groups take part in physically demanding work in harsh conditions. Physical actions are separated out to understand the musculoskeletal impact on the body- for instance twisting to transfer mealies from the cooking barrel to a transport trolley. Mealie vendor loads cooked mealies into a trolley. Photos: Rebecca Plumbley. The researcher is also investigating risks the activity poses to health, such as burns and scalds as well implications for respiratory and mental health. The interviews attempt to understand the work habits of these groups. This interplay between macro- and micro-ergonomics is of interest to AeT and is useful for the way in which it simultaneously addresses the finer grained challenges and broader aspects of informal work in Warwick Junction. This approach will allow for higher order problem solving to take place. Read more about Asiye eTafuleni’s research into tools in the article Technology and the Future of Work. Read Martha Chen’s article for the Environment and Urbanisation Journal Technology, informal workers and cities: Insights from Amedabhad (India), Durban (South Africa) and Lima (Peru).